Increase and boost customer retention with this printed Round Bluetooth Speaker as a mouth-watering incentive. 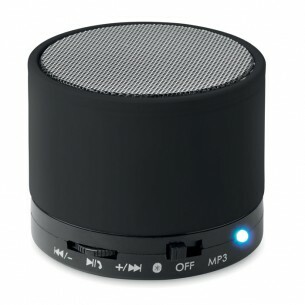 A wireless Bluetooth speaker boasting the latest technology, it comes in a sturdy case with a rubberised finish. Comes with an LED light indicator and a rechargeable Lithium 450 mAh battery, it also has an SD card port and an AUX/USB cable. With hands-free call function and FM radio receiver, this is one gadget your clients will surely find valuable. This round bluetooth speaker is made from mixed and can be purchased in black, red , white, orange, matt silver, royal blue, lime. Your logo can be printed on the first side - please check for any other positions. Our speaker items are printed in up to 2 colours via pad print, which is a technique suitable for almost all artwork and shapes.